This was the month that we finally made it to Turkey, a long-awaited destination that has eluded us for years. It was wonderful… and also not exactly the trip we had expected. April was incredibly busy, packed full with twists and turns we did not anticipate: our fast travels through March caught up to us in Turkey, and we ended up rearranging the bulk of our trip and skipping several destinations there to accommodate our dwindling energy levels and skyrocketing workloads. We’ll make it back to Turkey one day to finish our wish list, but in the meantime, we still managed to have a magnificent month. Finally touching down in Turkey. We have been dying to make it to both Turkey and Istanbul specifically for years: after starting to plan trips in both 2016 and 2017 that ended up getting scrapped, it felt amazing to finally feel the plane touchdown in a destination that had eluded us for so long. Riding in a hot air balloon in Cappadocia. Neither of us had ever ridden in a hot air balloon before April, and we couldn’t have picked a more magical spot for our first ride than Cappadocia. Rising gently through the air while admiring the fairy chimneys below us and the hundred other balloons in front of us is a feeling we will never forget. It was even magical enough to make me (briefly) forget my fear of heights! Eating all the Turkish breakfasts. Jeremy teases me all the time for my obsession with breakfast: wherever we are in the world, I’m always tempted by the first meal of the day. 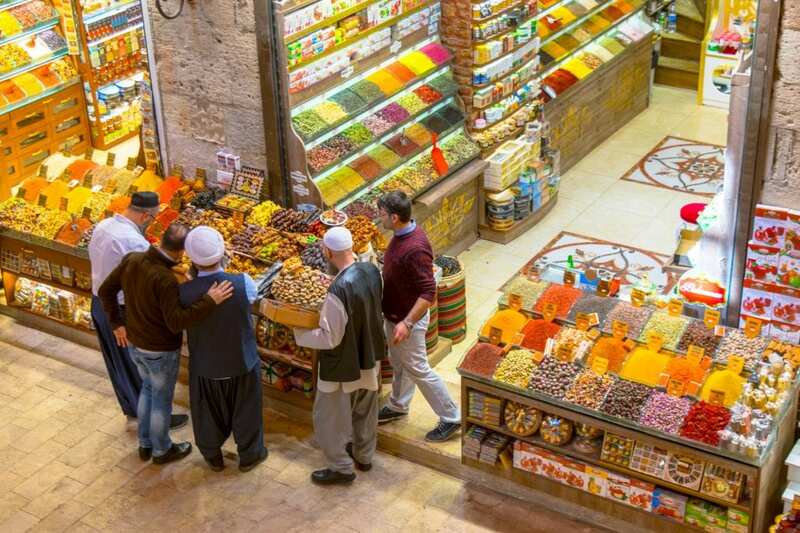 Turkey is the perfect place for that obsession, because Turkish breakfasts are legendary: delicious and enormous, they are generally made up of large spreads of bread, cheese, eggs, olives, jam, honey, and various dips and pastes, served with buckets of Turkish tea–in other words, they’re a piece of heaven on Earth. Our first Airbnb in Istanbul was the worst Airbnb experience we’ve ever had. When we checked into our Airbnb apartment in Istanbul, we quickly realized that what we had thought was going to be our haven to rest and catch up on work for two weeks, was… anything but that. The promised kitchen was non-existent, the host was nowhere in sight and couldn’t be reached (he had an employee available who didn’t have access to the Airbnb account), the bathroom reeked of mildew… and it was after dark and we had just arrived in the city. We ended up leaving the following morning and, after many back-and-forths with Airbnb’s customer support, got our money back. We’ve never had to leave an Airbnb before, and the whole thing was unsettling–the employee eventually admitted to us that they were speaking to Airbnb customer service on the phone on behalf of the host, so as far as we know, the host never once spoke with us or Airbnb–who even knows who he is. At the end of the day, we got our money back, but ended up bouncing around hotels during our first stint in Istanbul–hardly the relaxing time to work that we anticipated. 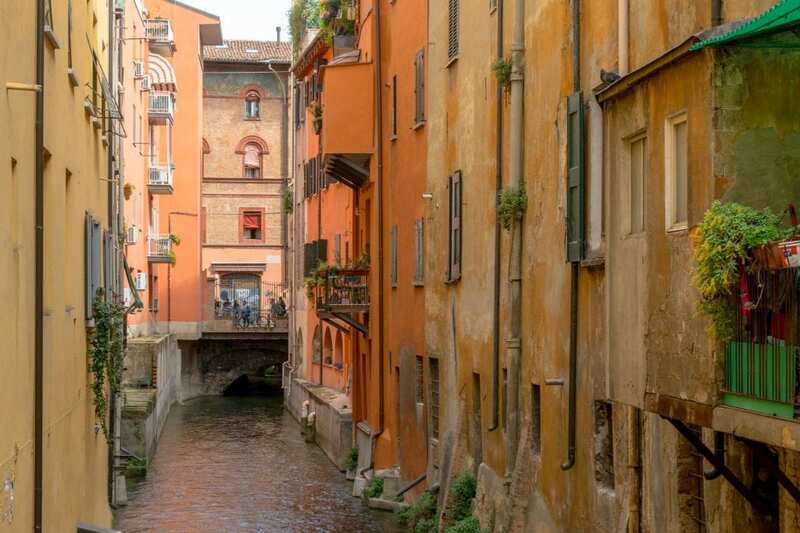 As a direct result of that fiasco, we logged onto Airbnb and booked a month-long stay in Bologna. No regrets. We paid for moving around too much in March with crashing energy levels in April. In Turkey, we planned to see Istanbul, Cappadocia, Pamukkale, Fethiye or Bodrum, and Selcuk. We ended up seeing… Istanbul and Cappadocia. Don’t get us wrong–we loved and enjoyed both, and are sorry to have missed the others–but after fast-paced travel in March and the Airbnb fiasco that ended up killing our two-week planned rest in Istanbul, we just weren’t up to more fast travel. Oh, well–at least we have an excuse to plan another trip to Turkey one day! Being in a destination where we do more grocery shopping than restaurant dining (hello, Italy) always reminds me of how handy having a built-in, washable, reusable tote can be: our RuMe bag weighs basically nothing and holds up to 50 pounds–this month, it’s carting pasta, pesto, and wine, and later this summer, it’ll (hopefully) double as a beach bag again. I love the idea behind this anthology: fiction authors are tasked with the job of telling their most memorable true travel story–and they pull it off beautifully. These stories captivated me from start to finish, pulling me across place and time to destinations as different as Kazakhstan and New Orleans and to settings that span across decades. If you love travel stories, I can’t recommend this book enough. We adore this shot of Jeremy and I with Neuschwanstein Castle in Bavaria, and Instagram agreed! 2 Weeks in Colombia: The Ultimate 14 Day Itinerary — Looking to plan a trip to Colombia? Here’s how to see the country’s highlights in just two weeks! Discovering What to Eat in Lisbon With Taste of Lisboa — We arrived at our Lisbon food tour in the Campo de Ourique neighborhood jetlagged and starving, and we left caffeinated and stuffed to the gills. Plus, there was chocolate cake–our kind of food tour for sure! The Perfect 3 Days in Paris Itinerary for First-Timers — One of the most detailed posts we have ever published, this 3 days in Paris guide will walk you through a Parisian trip you’ll never forget. 4 Days in Lisbon Was the Perfect First Taste of Portugal — Sailboat trips, castles, sunsets, pastries, bookstores–we found a lot to love about Lisbon (and Portugal) in just four days. The 10 Prettiest Bookstores in Europe — We teamed up with several other travel bloggers to show off some of the prettiest bookstores in Europe–we’ve only visited four of the ten ourselves, meaning that we have some more book-centered tourism to do in the future! Excluding a brief trip to the microstate of San Marino, it’s all about Italy in May: we’re going to be spending the bulk of the month exploring Emilia-Romagna from our base in Bologna before heading up to Bolzano for some quality time with family in the Dolomites. In addition to San Marino, we hope to also make day or overnight trips to nearby Modena (home to true balsamic vinegar), Parma (home to parmigiano reggiano), and Florence (home to wonderful memories from last fall and one of our favorite cities on Earth). So far, we are absolutely loving being back in one of our favorite countries of all time–we have been happily binging on one of the world’s best cuisines ever since we got here. It definitely was! We can’t recommend Turkey enough, it was an amazing place. That’s a shame about your Airbnb in Istanbul, and it’s a good thing you got your money back. I hope you reported that listing or left a review, it’s good to warn other travellers. I’ll be back in Italy this week, but more south in Sicily! Looking forward to the next part of the journey. Ooooh, Sicily sounds wonderful! We really want to explore more of the southern half of Italy–hopefully next year we’ll get the chance! 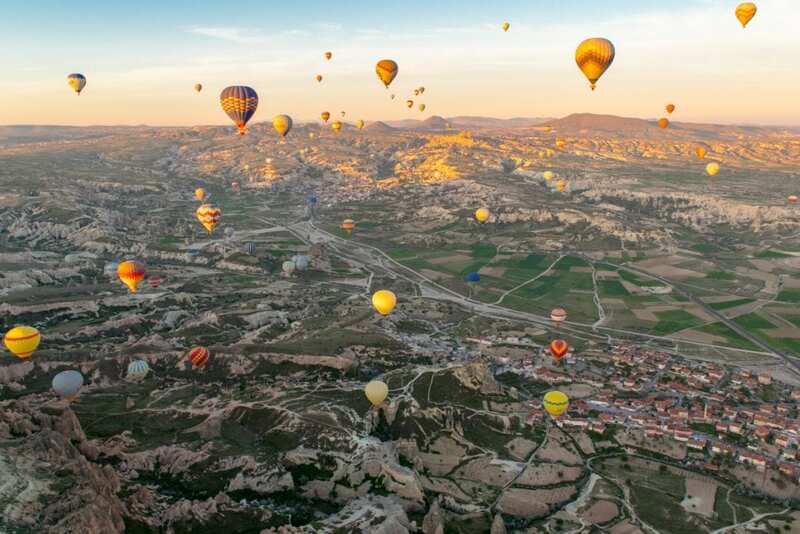 Wow, I truly envy you for the hot air balloon in Cappadocia. I have seen so many pictures already of that event and also on yours it looks magical, truly beautiful. Such a pity to hear about your Airbnb experience in Turkey. Of course this is a nightmare and no traveller wants or should experience something like this. But then again Turkish breakfast sounds incredible, I guess I would be 5kg heavier after two weeks vacation there. Sorry to hear about your Istanbul Airbnd fiasco. But glad that you still managed to have a wonderful time in Turkey. Neither I or my OH have done a hot air balloon ride and our plan as yours is to do the first one in Cappadocia. The spectacular and surrealistic landscape of Cappadocia would be the ideal location for the ride, I feel. It’s definitely the perfect first place to do it! We’ve considered hot air balloon rides in a few other places, but they’re so expensive that we wanted to save it for somewhere truly epic. Cappadocia fits the bill! So awesome that you finally made it to Turkey! I actually made it to Istanbul in April as well for my first time ever, although I only had one day there, hardly enough time to explore everything I would’ve wanted to explore. I can definitely relate to travel getting too tiring and wanting to slow down and stay put in one place for a while. Sorry to hear about your terrible Airbnb experience in Istanbul but glad to hear the rest was good! I can imagine the joy of being in a place that eluded you for long. Istanbul is one of my favorite places too though i visited it 6 years ago and things haven’t changed much since then what I hear from other travelers. Your experience on Airbnb was a shame and I am glad you voiced it and got your money back. Such experiences make us more aware of what the world is. I am so impressed to see your travel line up. San Marino is another great place I want to go. Do share your stories of May. No, I doubt it has changed much at all–one of the coolest things about traveling in such old places is that they tend to stay similar from year to year! If I want to visit the Hagia Sophia again in 50 years, I’m betting I’ll be able to! I like your style of reflecting on a month like this. I would never think of Turkey as a breakfast place but it sounds brilliant. I can totally relate to that crashing feeling when your travelling, we just recently had a similar thing in Ecuador last month. I think sometimes it’s important just to take a few days to enjoy where you are rather than constantly thinking about where to go next. Sorry to hear you had a bad experience with that AirBnb in Istanbul, that sounds incredibly frustrating! It was, but c’est la vie! At least Istanbul itself (and the breakfasts!) were wonderful. I’m glad you had a good tie in Turkey despite that horrible-sounding AirBnB. The timing of this post is so perfect because I’m actually going to Bavaria next month and can’t wait to see Sleeping Beauty’s castle! Would love your recommendations for other must-sees there. Ah, that sounds wonderful! 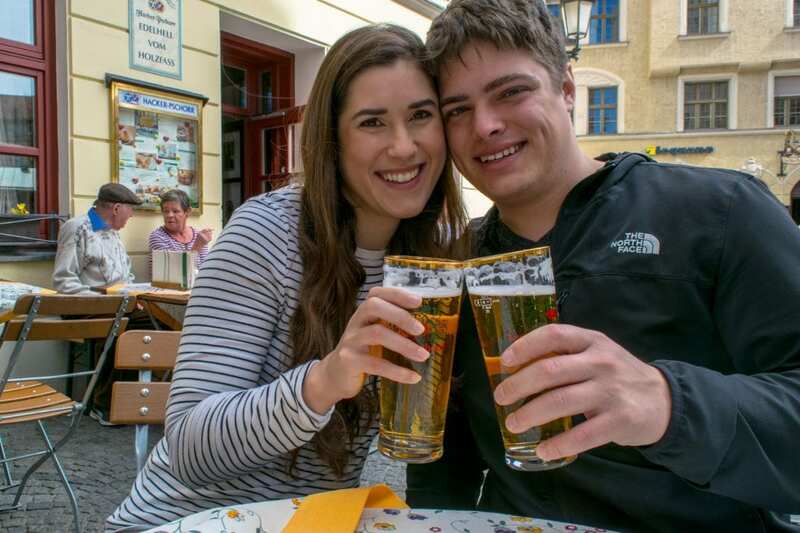 We weren’t in Bavaria for long so don’t have too many recommendations, but definitely make sure to drink plenty of beer (I don’t even like beer, it’s better there!) and try the Bavarian meat loaf–it’s one of our new favorite dishes! We didn’t have a chance to do this, but we hear great things about a day trip to Rothenburg and will try to do it next time. Istanbul Kate! Wonderful. One of my fave cities on earth. Loved the 2 c’s there; glorious coffee and huge cats LOL! We had to return home for fam stuff so cancelled our Cappa trip but will return one day. Haha yes, all about the coffee and cats!! Istanbul was a blast, we look forward to getting back again one day.